After moving to Hotchkiss, Colo., from Lake Tahoe, Nev., in 1998, Jerry Adams and his wife, Kay, knew something was wrong. "The 65 acres were completely worn out," he said. "All of it had been overgrazed by cattle. The soil was depleted from a cycle that had gone on for over 50 years. There was no life left in it." Previous ranchers cut hay, turned cattle out on the stubble and harrowed the manure back in. Planning to grow hay as well, the couple originally "did what everyone else did." They went to the local co-op for two years for chemical fertilizers and even tried chicken manure, but there was still a problem. "(Chicken manure) just added rocks and sticks to everything," Adams said. Even with the couple trying to solve the problem with new solutions, not a lot changed. As a retired fire chief, Adams studied soil biology prior to implementing prescribed burning in the environmentally-sensitive Lake Tahoe area. He knew he needed to manage the soil with enzymes, bacteria, amino acids and fungi. The solution ended up being, well, a bit fishy. He thought back to the old-time prairie farmers and the way nature worked for them. "Soil is like a digestive system and needs to process things, you must have active biology working in it for you," Adams said. He decided to try a Native American practice. It was one tribes have implemented since Pilgrims started to settle in the states. He decided to use fish — in a liquid form. Adams started to drive to Wisconsin every year to pick up barrels of what the processing factories cast off — tails, fins, gills, heads and entrails. "Everything is ground up together into a liquid and it's the consistency of chocolate milk," he said. After he added the liquid to his land, he said he saw quality and growth in his hay crops. He is able to harvests two crops each year. The third cut is left in the fields for deer and elk. Neighbors started to ask where they could get the fertilizer. Soon, Adams started to get the fertilizer for his neighbors as well. But the amount he needed to bring back became taxing. "I could barely make it over Monarch Pass," he said. The popularity for the fertilizer isn't just for hay growers, though. "It'll grow anything," Adams said. "My wife even uses it on her orchids." His solution to the growing problem?Build his own facility. Adams started his own business, called DR Fish Fertilizer. Adams provides certified, organic liquid fish fertilizer, biological products and trace elements on the western slope. Tankers pick up the liquid fish from Wisconsin and deliver as in the spring and as needed. One fruit-growing customer alone buys 1,600 gallons. "He adds it to his peach, apricot, pear and apple trees every 14-21 days during the season." Because it's cold-processed, the liquid fish never gets more than 90 degrees. This leaves the bacteria, fungi, amino acids and enzymes unharmed in the process. 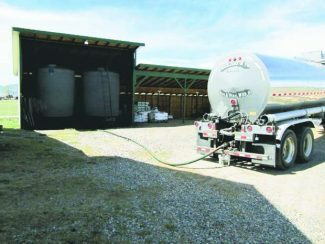 Although a smelly process, Adams transfers two 3,000 gallon tanks into containers customers bring to be get their fertilizer. One the liquid fish is worked into the dirt, the smell disappears. Adams said three to four gallons per acre is needed to rebuild soil. He said his hay crop has thrived since he started to use the fertilizer. DR Fish carries biological products such as compost digester, foliar fertilizers, enzymes and bioremediation products. These come from a 30-year, family-run business called Tainio Technology Technique, Inc., known for helping farmers around the world to grow the best, highest-yielding crops. Another key product DR Fish carries is Humate, which provides trace elements, humic and fulvic acids, as well as carbon — a food for organic matter. Former horse breeders, Adams and Kay recognize high-quality hay. He once raised Appaloosa stock horses out of the Red Eagle Peacock line. In 1976 one of their yearlings, Blazing Eagle, took second place at the Annual Nevada State showings. "We had a broodmare that went back to Man O' War (the 1920's Thoroughbred stallion that won 20 out of 21 starts). Her dam was from a U.S. Cavalry Remount bloodline. They were quiet, easy-going horses." Originally, Adams and Kay planned to get back into breeding and training horses once they'd settled in Colorado. "Sixty-five acres was too much to keep up with," Adams said. "Now we only have goats, chickens, three dogs and one cat." Almost 75, Adams does his own hay work with the help of a neighbor to cut, bale and stack it in the barn. Adams and Kay, who have been married for 36 years, remain active on two water boards. She is also on the fair board, is Grange master at the local Grange Hall and is in charge of fruits and vegetables at the Heritage Hall during fair time. Another thing this active couple doesn't do anymore is garden — even with their own premium fertilizer. "We simply don't have time to do it anymore," Adams said. "Instead, we trade with friends who in turn bring us fresh vegetables. It works out great." Every fall at the Rogers Mesa processing plant, Kay loads up on the specific fruits that were grown from liquid fish and biological products.